Discussion in 'Nogizaka46 News & Releases' started by ForrestFuller, Aug 30, 2016. Ranked !st in Oricon Daily single rankings. I hope it will eventually reach No 1. Go Nogi Go! She's got a beautiful big smile that is genuine. She's one of the main reason I followed Nogi. yeahhhh.. you are damn true!! real 'lesbian' though she is normal..
she made me laugh the most..
828,000+ First Week Sales. Their 15th Consecutive #1 Single. I know it debuted pretty high (8th) which pretty good. Will be #1 this week on Billboard Japan. this is the power of only 2 generations..i hope they wont add more girls just to achieve 1mil. 3rd gen is needed but i hope the addition will stop for another two years until some of old girls will grad. no need overcrowded likke 48g. management need to find potential girls to keep nogi popularity stabilize, not remain on over populated members to buy hs. that say..im so proud of nogi. can anyone tell me the lat single where akb hs has only akb members? last single before ske nmb hkt are included. SKE are as old as HS. They started at the same time. They had gimmicks before but different ones. Sakura no Hanabiratachi (2008 version) was the last AKB solo single. Unless you count the digital-only single Baby Baby Baby. The next single was Oogoe Diamond (October 2008). It was the first single with their current record label, King Records. It was also the first to feature sister group members in senbatsu, with Matsui Jurina as centre, despite the release date being only 5 days after Team S's theatre debut. And it was the beginning of Theatre Editions and HS events as they are now. Decent digital rank for sayonara no Imi. The teaser for next week's Nogichuu is interesting... Can't wait for the show! 15 number ones out of 16 singles. Impressive, is it not? And... maybe... even 900 k was possible =O . Oh my! Or least wery close of it! OMG That's awesome! 200k more and 1 million. Really love this song. Ranze subs for Kiichan, for future senbatsu maybe? 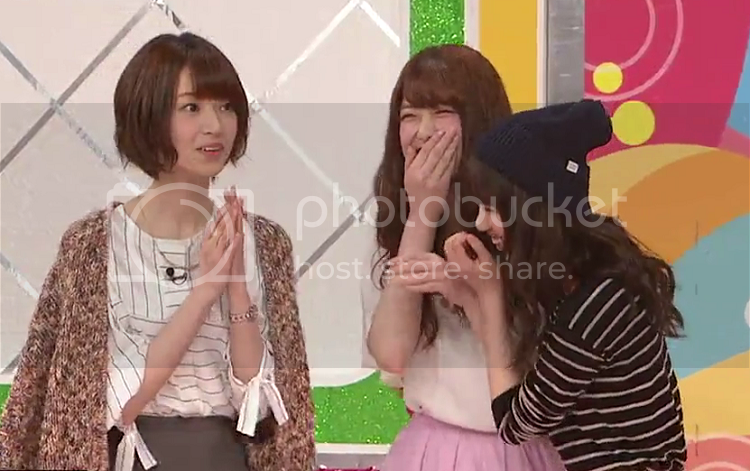 I don't know, but I can't help but laugh at Paruru with that intro . Love her still, gonna miss her too. That should be 95% of total slots. So happy to see more girls sold some slots, even sold out.